Oh I'm late to the galaxy print party, aren't I? I hope I'm still allowed in. I love this take on the print. Although green isn't my usual colour of choice, I actually think this blouse is surprisingly complimentary to my paleness - cheers green spaceyness. I'll have to give green a chance more often. 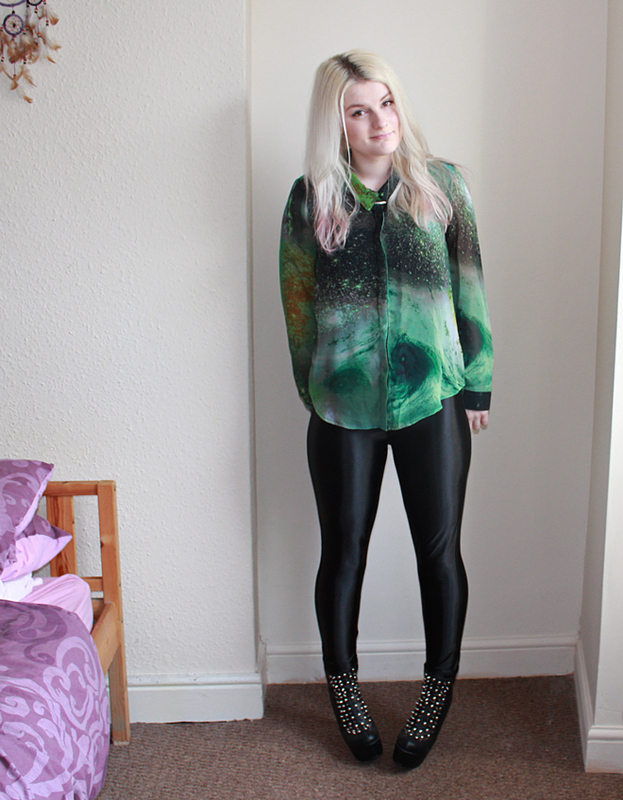 Plus, I think this is the first colourful thing I've worn in TIME man! I've become a right old monochrome and neutrals addict, so I'm pleased to finally reveal me in colour. Wahoo! You can get 30% off everything on Pretty Little Thing at the moment using the code APRIL30 - even more wahoo-y! You might notice the ends of my hair are slightly pink here. In our AX Paris goodie bags we got some coloured hairspray (remember that from your childhood?! If not, you've been neglected from this magical thing.) so I decided to try it out the very next day. Here's my hair with a pink dip dye thing goin' on if you missed it on my Instagram. If I use it again I'll put some proper photos up as it's so easy to do! I'm currently lol-ing at the poor outcome of these photos. Set up my tripod, camera, remote shutter as you do... took some photos (including a close up of my fab little Bohemian Collective above knuckle ring and a pleather jacket)... popped them onto my laptop and half of them were out of focus. Terrific. Hence the 2cm movement of my body from the first photo to the next - haha! Although, it's not surprising as my new camera doesn't seem to like the lighting situation in my room so I've started to have to use flash.. eeek (personally, I really hate standard flash for portraits - it looks too full on, but it'll have to do!). Hope you're all having a fab weekend. This is the one for my dissertation. Must be finito by tomorrow so I have plenty of time to edit it and get it bound - gulp! Love this shirt, it's purdddddyyy!!! I really like the shirt! Green does suit you and you should do a post on the hairspray because it looks awesome! I struggle with the same thing homes! Unfortunately I have NO space in my room which doesn't help haha. Such a cool shirt, you look out of this world! A-hem. I was late to the galaxy print party too but I love it now! This shirt is gorgeous! LOVE the shirt - your hair looks so cute dipdyed too! haha I hate that! Sometimes it feels like I'll take 100 photos and then the second I look at them on the laptop they're a complete fail!! Love the galaxy print, it's different from the normal galaxy print and I like that! oh that shirt is so flippin' great. That shirt is amazing, your not too late! Come on in !! 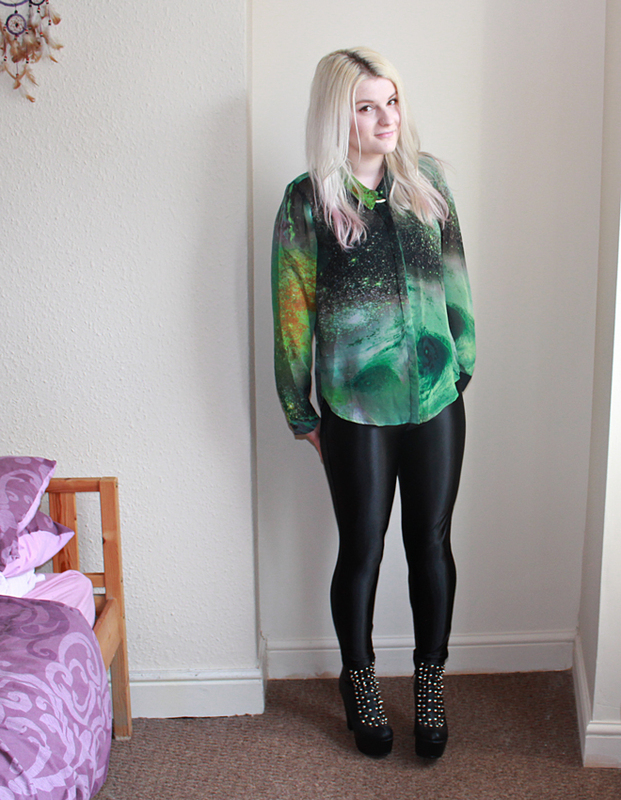 Ive been after a galaxy print shirt for soo long! Really suits you! The shirt is amazing! I love the colour!